First of all, Happy 2019, my friend! Sending you a big hug 🤗! There’s something amazing about being able to live one more year. Regardless of whether last year was great for you or not, what we can ALL agree on is that this year, 2019 CAN be a better year than last year. How great 2019 is, LARGELY depends on your attitude, so keep it in check. A lot of people have published their review of 2018 and shared their New Year’s resolutions for 2019. I want to go beyond that. 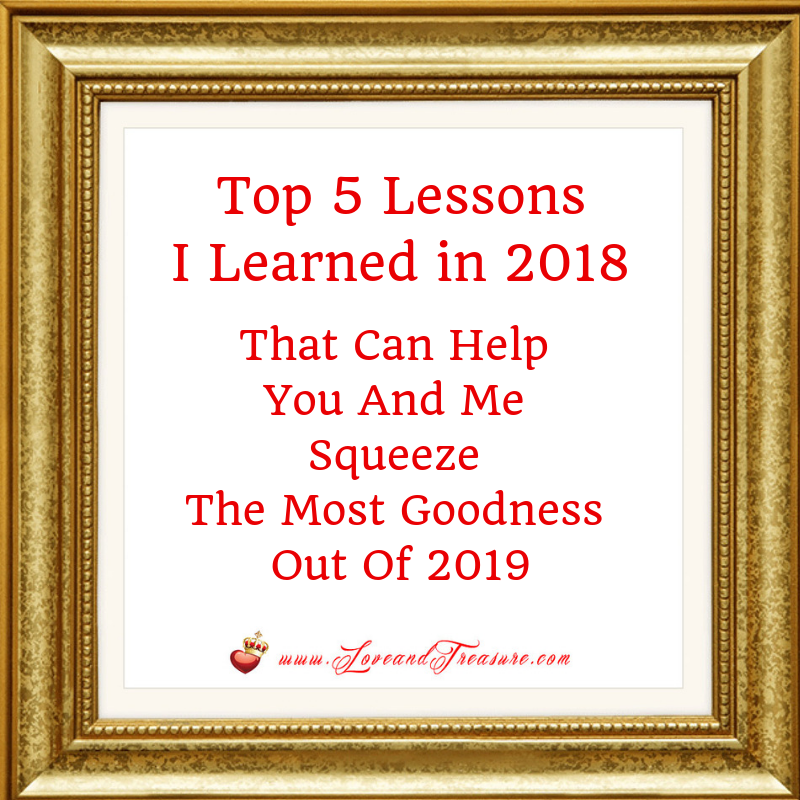 Today, I want to share with you 5 lessons that I learned in 2018 that can help YOU squeeze out the most goodness in 2019. To make it more positive. And to allow you to have the most amount of joy. That ☝️ in and of itself is a blessing. We can simply start from that frame of mind, and suddenly, things become more positive. Last year may or may not have been the perfect year, but you’re here. Alive. Today. In a country, with internet, on a device that you were able to purchase because of everything that you have to contribute to the world via your talents and skills. Or if you were gifted your device, you had/have someone in your life who was this generous or who has a good job that allows you to have a device to read this blog on. There are people (many of them super young people), who unfortunately didn’t make it to the end of last year. Therefore, celebrating a new birthday each year and celebrating the ushering in of a new year, regardless of whether you like to celebrate birthdays or New Years or not, becomes more and more of a blessing each year. And guess what? 2019 will have challenges, for sure. I mean, what year doesn’t? But you’ll make it through if you have LIFE. LIFE is the end goal. If we have that, our circumstances still have a chance of improving, changing, evolving or simply continuing to give us joy. Have you ever had a dream, a desire, a prayer that you THINK is SOOOO difficult that you know that if Heaven pulled it off, that any doubts you’ve ever had about God would dissipate? Please know that even the hardest miracles happen. That’s why they’re called miracles. There are some miracles that are SOOOO huge that I would like to chat with God someday and have Him tell me the behind-the-scenes of how He made the magic happen. These are miracles that make me wonder if they were hard even for God to pull off. Have you had miracles happen like that? Or have you had a desire that you think will ONLY come true as a result of a miracle? Even though many of us go through some out-of-this-world, crazy, never-would-you-have expected-this challenges, it’s great to know that God, the Universe, the galaxy, the cosmos, Life, or whomever or whatever else you believe in HAS YOUR BACK. And usually, it’s not just one thing that is supporting you. I believe in angels and how they’re always looking out for me. But they like to be asked for help because they respect our free will. So ASK for help. KNOW that your pleas aren’t falling in deaf ears. Someone IS listening. With so many injustices in the world and with so many injustices that have happened in your life, I know that trusting that ANYBODY FUUUUUUULLY has your back is an act of faith in an of itself. It’s a miracle to have ONE person like that in your life. It’s a miracle who would unconditionally support you and piece your world together when you could swear that it’s coming apart. Having a handful of those people… must feel like Heaven on Earth… and if you have THAT—— focus on that any time you’re in despair. Most people aren’t as lucky as you. But what ALL of us have is the unconditional, love and support from a Higher Power. That Higher Power doesn’t always let us have our way, but it always gives us lessons. One of those lessons is how much stronger and more resilient we are. We don’t give ourselves enough credit for that. But with each problem that we overcome or circumvent, we become wiser and stronger. The rug beneath our feet is sometimes wiggled a bit, other times it’s pulled completely out… but in the end, as long as we have Life, we can call it a success. And as long as we have our loved ones, we can feel like we have our world. Simply believing that a miracle is POSSIBLE changes EVERYTHING. Because according to A Course In Miracles, a miracle is simply a shift in perception. (In case you’re wondering, A Course In Miracles is a non-denominational book, and it has an abundance of knowledge written in easy-to-understand language. It contains such powerful golden nuggets, that even knowing a handful of them can really start to increase the love you experience and diminish the power that fears have over you). The fact that that you can have enough faith and enough humility to acknowledge that maybe not ALL aspects of that this issue that you’re facing fall in YOUR hands, and that someone wants this miracle just as much, if not MORE for you because they love you and believe that you are worthy of such a miracle… is wonderful. And we are all worthy of such miracles. They’re like winning an Oscar. Except that Life, at some point, WILL give you a miracle like this, it’s not just reserved for a select few. If you look back at your life, you’ll notice that Life probably ALREADY gave you some of these miracles. The reason why we don’t feel the glory of these miracles sometimes is because there are still things that we have to learn about the way life shook out and the choices we made. So yeah, when it comes to the miracle that you most want right now, pour hours, days, weeks, months even years toward your miracle. Give it ALL you have. I repeat — give it your ALL. The effort that you put in with your hands, your mind, your soul, your will, your heart and your belief over and over and over again reaffirming that a miracle IS possible, that Life DOES have your back, in spite of everything… that you actually ARE able to be in a receiving state of mind for a miracle to happen…. is what’s probably going to make the difference between you getting that miracle or not. Once you that, and when life surprises you with that miracle- you’ll be surprised that it happened to you but most importantly, you’ll be SUPER grateful. Loneliness is an unspoken epidemic around the world. We think we’re SUPER connected to each other because of social media. But often, social media is just a tangent we take daily, multiple times a day, to soothe the loneliness that we feel inside. Often when we face hardships we feel the most alone. And it’s during times like those where we’re more likely to be sucked in by social media. I’ve loved podcasts for years, but often, listening to a podcast was more of a chore than a pleasurable experience. 1) The Podcast App – can we just say an angelic “ahhhh” for this podcast app that will become a game changer for you? (Even though you might not have used it, yet. Trust me on this one). The way that I describe this podcast is… user-friendliness at your fingertips. 1) Go to App Store (I’m glad to see that the Podcast App is available on the Google Play Store). 2) Search for the Podcast App. 2) Download the Podcast App by entering your apple id password. 3) Open the Podcast App. 4) Search for a podcast that you’ve been wanting to listen to by typing it into the search field. If you can’t think of one or you’re not necessarily excited by the podcasts that you know, I want to recommend a podcast by Becky Higgins called Cultivate A Good Life. Becky Higgins, if you don’t know is the CEO and superwoman behind one of my favorite products EVER that I’ve recommended to you in the past, especially on my Holiday Gift Guides, called Project Life. The reason I love this the Project Life company as a whole so much is because it’s full of positivity and it’s a daily reminder to be focused on the positive things of our life. Our families, our friends, ourselves, our routines, our Life as a whole. In the Cultivate A Good Life podcast, you’ll be able to pick up on the cheery, practical and super real personality of Becky Higgins and her friend and co-host Becky Proudfit. It’ll allow you to listen to a variety of topics that are interesting… kind of like what you would listen to if you went out with a group of friends. And best of all, you get to enjoy the conversation without worrying too much that you want to take notes because you can always link to Becky Higgin’s site to get the show notes. You can even find the podcast episodes there if you want to listen to them from your computer (although I highly recommend listening from the Podcast App. This was my favorite podcast in 2018 and I have a feeling it’s going to continue to be my favorite for a long time. It’s wonderful to listen to podcasts while you’re folding laundry, cleaning the house, emptying the dishwasher, filling the dishwasher and decluttering. They’re also great to listen to after you drop the kids off at school or while you’re driving to and from work. What’s going on in the United States is a circus. We all know that at least in the United States, the last couple of years haven’t been the easiest in our nation’s history. In my opinion (and it’s okay if you disagree), no road has ever seemed as long, tiring and never-ending as this administration’s has. But we’re beyond the halfway mark. And who knows? We might even be 90% there. And while it was hard for me to be creative for a long time because I was always worried about whether or not our nation still had a pulse… CREATIVITY is actually SUPER healing. It’s MUCH more soothing to the mind and soul to be producing great things behind-the-scenes like blog posts, websites and courses than to be glued to the news or Twitter 24/7. And being creative is not always just about being productive. Often, creativity is a matter of being present. Other times, creativity is a matter of feeling joy. I know that in our go-go-go , non-stop life…. creativity is one of those things that we save for later, for when we feel like it, for when inspiration strikes, for when we have time. BUT if you’re a content creator reading this… and even if you’re not, KNOW that the world, will hopefully still rotate with or without you being glued to the news 24/7. After all, the bad times seem eternal, and the good times seem to be fleeting. So it’s important to be fully focused and appreciative of the good things… the many blessings both big and small that we often take for granted. Like being a good parent, a good sister, daughter, friend and partner. Make progress in those areas as well. Make progress in the areas that matter. What the world needs is not your constant observation. What the world needs is your consistent action of sharing your gifts with the world. I worked on my projects more than I’ve ever had. I woke up much earlier and stayed up later than usual to make progress. I worked on weekends when I could really focus on my projects for longer periods of time.. I improved my site behind-the-scenes. I published a free course. I am working on three other courses and three other sites. This year, I’ll continue to make progress even though times are still uncertain. Now that I’m more productive, I realize that what I create brings me joy and it gets me closer and closer to helping those who need it. So what are your goals? What can you do to feel happy with YOURSELF? In order to be able to squeeze the most goodness out of 2019, you HAVE TO BE super-conscientious of what seeds you plant along the way. People often say that when life gives you lemons that you should make lemonade. And that’s all fine and good, but if you don’t like lemonade, lemons or sour things, maybe you can plant a watermelon plant. That’ll give you an abundance of sweet juice. In other words, if you want a different outcome, change your conditions. Change what you do at the beginning or middle, so that the end is different. So if you need to work on your body, your personality, your finances, your parenting, your relationships or how you deal with your limiting beliefs… start by changing the first belief… which is that things can actually be different for you. Better. More peaceful. More joyous. More pleasant. And do so by writing things down in your calendar. My favorite digital calendar/ planner / organizer of dreams, ideas and to-dos is Asana . And my favorite paper calendar is the MAMBI planner, which stands for Me and My Big Ideas. Prioritize the areas of your life that matter to you. Then make the time to do them. So yeah, those are the 5 lessons that I learned last year that can help you have a wonderful year this year. What was a lesson that last year taught you that will help you have a more positive year this year?